Sunflowers are my absolute favorite. This is such a *wonderful* photo! So glad you're home and that you had a restful, fun time in New England. Your timing was perfect to get out of town, right? We 'weathered' Irene fine -- lots of branches down and no power for 11 hours, but most of that was sleeping or at church, so no problem. I absolutely love giant sun flowers!!! 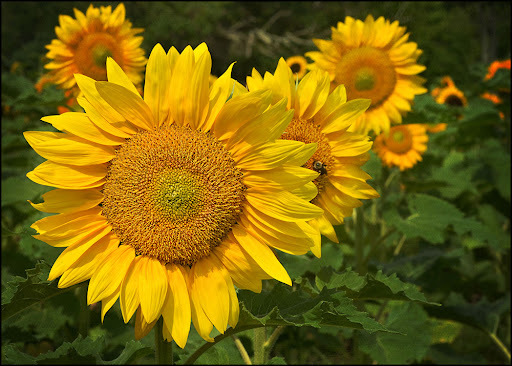 Beautiful image of the sunflowers - so vibrant! I love this one -- it has such a depth and 3-dimensionality to it. I needed that burst of sunshine just now, thanks! Gorgeous. I adore sunflowers. I can't believe summer stock sunday is over already. School daze begin. Your photos make me happy. I love this delightful composition with sunflowers, exquisite color and an attractive light.